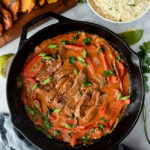 This Thai Red Curry Beef Tenderloin Skillet makes for a quick, one pan weeknight dinner that’s anything but boring. It’s December, which means you’re probably getting inundated with holiday baking recipes. Perhaps it’s a testament to how I use Pinterest, but my feed is simply packed with desserts and sweets and paleo-ified versions of every kind of cookie imaginable. While I don’t think there’s anything wrong with holiday treats, I figured I’d throw a non-dessert-related recipe out there for those (like me) who feel like they’re drowning in sugar. This spicy little number comes together in about 30 minutes (especially if you prep in advance by slicing the bell pepper and onion). It feeds 2-3 depending on how voracious your appetite is. I like serving it with cauli-rice, but you could also use white rice if you eat it. As you can see in the pictures, I also whipped up a batch of tostones, but that’s totally optional. We all know how much I love plantains! 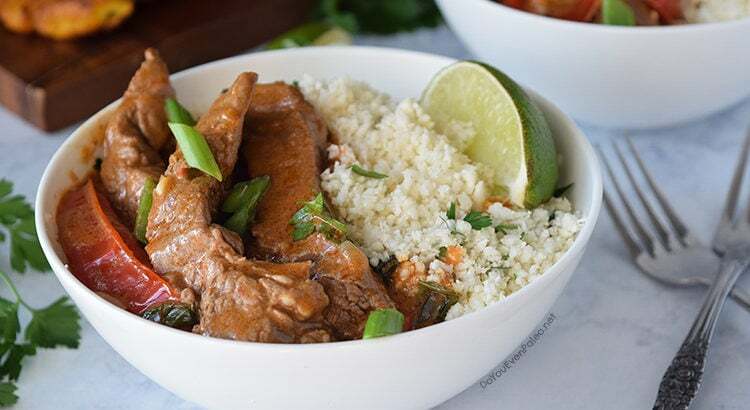 In this recipe, I use a pre-made red curry paste. Is that cheating? I know some purists would probably call it cheating. But sometimes quick weeknight meals require pre-made help. Anyway, I’m not professional chef. And at least it’s not throwing together a cake mix and a can of pumpkin and calling it the best brownie recipe ever. I maintain that homemade is superior 90% of the time. If not more. At some point, I’ll throw together a standalone post about making cauliflower rice (cauli-rice). Until then, though, you can visit this old post for a quick run down…or use Tasty Yummies’ tutorial. When I make cauli-rice, I pulse cauliflower florets in the food processor and then cook with a teaspoon or so of coconut oil on medium-high heat for 2 to 3 minutes. I try to avoid cooking it for too long. For meals like this, I toss the cauli-rice with some minced cilantro for an extra pep. 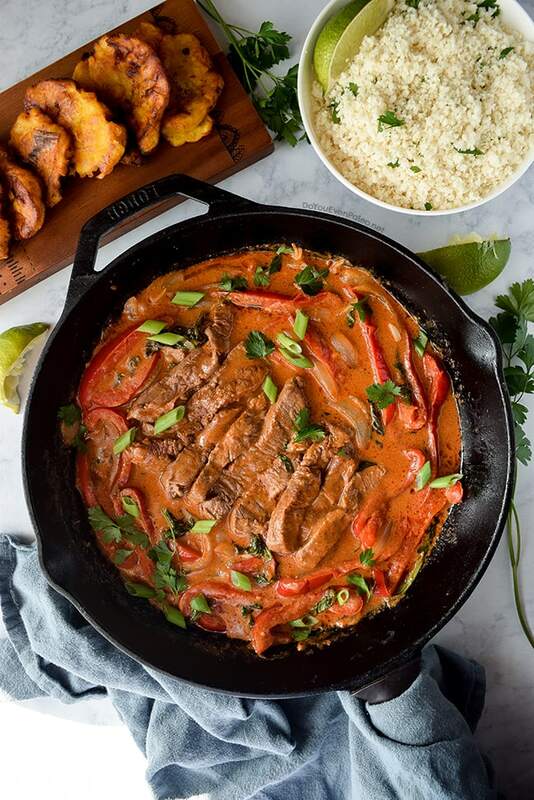 Whichever route you go, this Thai red curry beef tenderloin is sure to please. 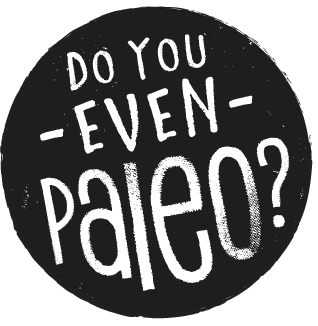 Bonuses: it reheats well, it’s paleo, it’s Whole30-friendly, it’s 21DSD friendly. Obviously, you can’t go wrong with this meal! 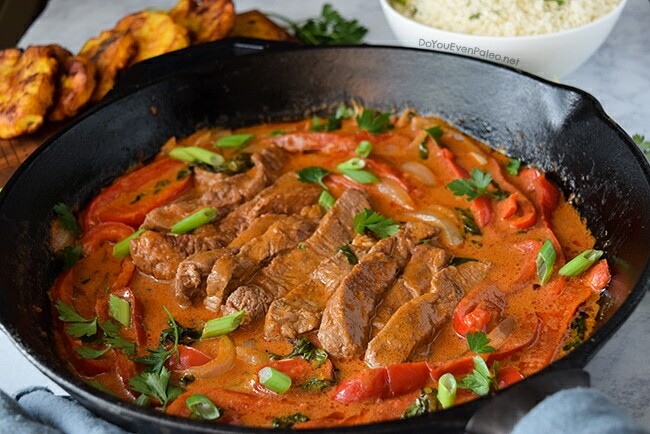 Pour half the can of coconut milk into a large skillet and stir in red curry paste. Bring the mixture to a boil over medium-high heat. Add remaining coconut milk, fish sauce, and crushed red pepper. Boil for 2 minutes, stirring constantly. Add garlic, bell pepper, and onion and reduce heat to medium. Simmer for about 8 minutes or until bell pepper and onion have softened. Add beef and cook for 3 minutes or until it reaches your desired level of doneness, stirring occasionally. Remove the skillet from heat and add basil leaves, lime juice, and sea salt. To prepare cauliflower rice, Heat coconut oil in a skillet over medium-high heat. Add riced cauliflower and sauté for 1-2 minutes. Remove from heat. 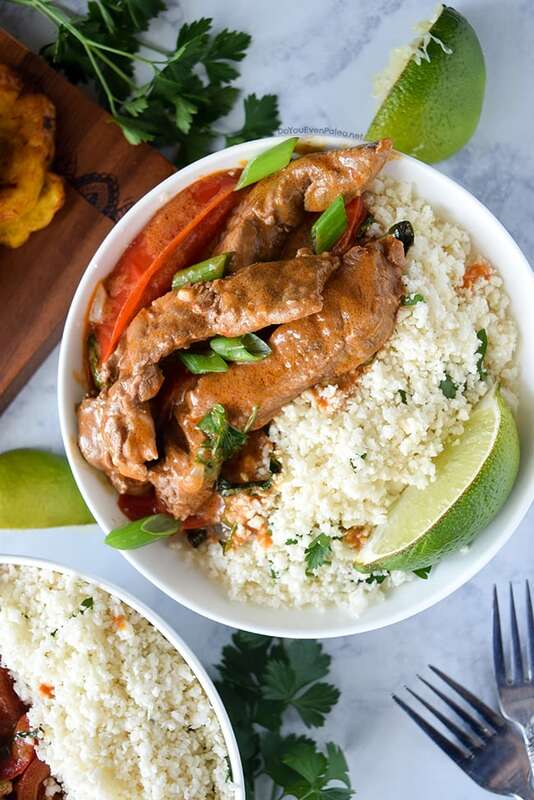 Serve beef and veggies over cauliflower rice and garnish with lime wedges and basil leaves. Don't subscribe All Replies to my comments Notify me of followup comments via e-mail. 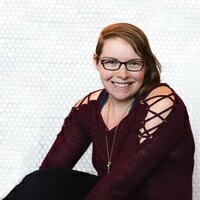 You can also <a href='https://www.doyouevenpaleo.net/comment-subscriptions/?srp=2056&srk=87505361eee98908ddf6ccb8681f50d6&sra=s&srsrc=f'>subscribe</a> without commenting.